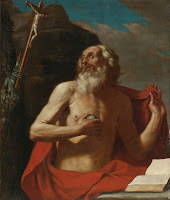 Born in the year 342, Saint Jerome was raised to be a Christian, but when he went to Rome as a young man to continue his education, he lost his way. Little by little, Jerome started to make his own pleasure more important than anything else, except on Sundays, when he would visit the tombs of the martyrs. Then he went on a trip to see the Holy Land. He ended up living with monks in the desert for four years, where he fought against temptation until he dreamed that he was being judged for his Christian life. “Where your treasure is, your heart is also,” the judge said. That’s when Jerome was able to leave behind all his selfish ways. He became an expert on the Biblical languages and provided a corrected Latin translation of the New Testament, the psalms and most of the Old Testament for the Church. Saint Jerome, pray for us!